Another Tweet Tasting you say? 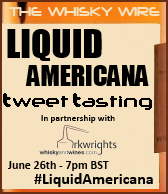 Well in addition to our current bounty of branded events, we’re absolutely thrilled to announce our second themed night of tweet tastery, this time exploring the wondrous world of ‘Liquid Americana’. Yet again we’ll be teaming up with Arkwrights Whisky and Wines, to bring you a dramspanking evening of dramfotainment, as we sample blind a clutch of cracking bourbons, ryes and other dramming delights from our friends across the pond. The closing date to register your interest in the tasting is Friday the 31st of May. If you are registering to take part please make sure that you will actually be free on the night!